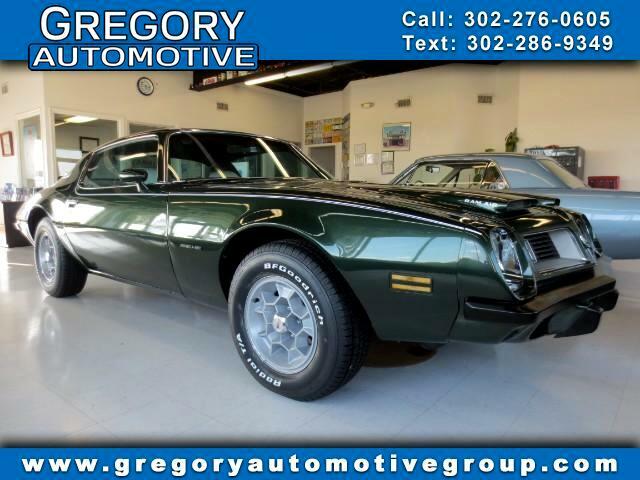 Used 1975 Pontiac Firebird Formula for Sale in New Castle DE 19720 Gregory Automotive Group Inc. This 1975 Pontiac Firebird Formula Esprit, 1 of 1 Special Order Vehicle, With Esprit Package and Formula 350 Package, Ultra Rare, One Of A Kind, Power Steering, Power Windows, Power Locks, Power Brakes, Safe-T-Track Differential, Recessed Windshield Wipers, Honeycomb Wheels, Body Side Moldings, Window Sill + Hood Rear Edge Moldings, Door Edge Guarsa, Wheel Opening Moldings, Cordova Top, Custom Air Conditioning, RH Visor Vanity Mirror, Front Seat Console, Accent Stripes, Heavy Duty Air Cleaner, Space Saver Spare Tire, FR78X15 Radial Tires, Headlamp Warning Buzzer, Electric Clock, AM/FM Radio, Custom Trim Group (Door Handle Ornamentation, Pedal Trim Package, Custom Bucket Seats, Custom Rear Seat, Custom Interior Appointments), Lamp Group (Luggage Lamp, Glove Box Lamp, Courtesy Lamp), And White Vinyl Seats. One Owner With Documentation! This vehicle had one previous owner. This vehicle comes with a spare key. A mini spare tire is included with this vehicle. The car was previously owned by a non smoker. The battery is in excellent condition. The brakes are in great condition. The transmission shifts very smoothly. This vehicle has no previous collision damage. The engine is functioning properly and has no issues. The exterior was well maintained and is extra clean. The interior was well maintained and is extra clean. This vehicle comes with a new set of tires. No dings are visible on this vehicle. The paint is in great shape and condition. The front windshield is in excellent condition. Message: Thought you might be interested in this 1975 Pontiac Firebird.